(a) Disengage the claw and guide to remove the lower No. 3 steering wheel cover. 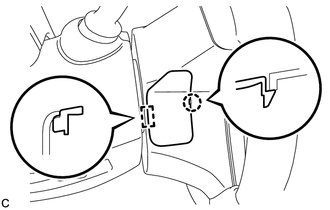 (a) Disengage the claw and guide to remove the lower No. 2 steering wheel cover. (c) Using a screwdriver, push up the torsion spring to disengage the pin. Insert the screwdriver from the installation hole of the lower No. 3 steering wheel cover. 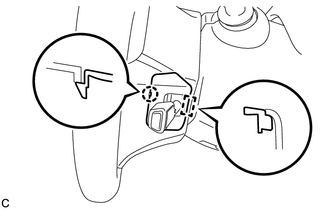 (d) Using a screwdriver, push in the 2 torsion springs to disengage the 2 pins. Do not drop the steering pad. Insert the screwdriver from the installation holes in the lower No. 3 steering wheel cover and lower No. 2 steering wheel cover. 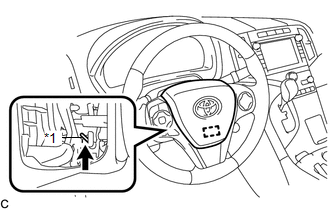 (e) Pull out the steering pad from the steering wheel assembly and support the steering pad with one hand. 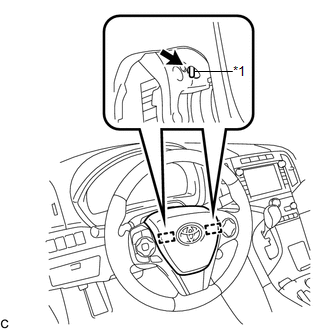 (f) Disconnect the horn connector from the steering pad. (g) Using a screwdriver with its tip wrapped with protective tape, release the 2 airbag connector locks. 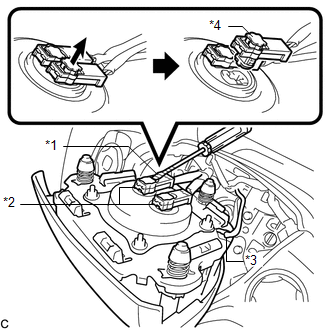 (h) Disconnect the 2 airbag connectors to remove the steering pad.